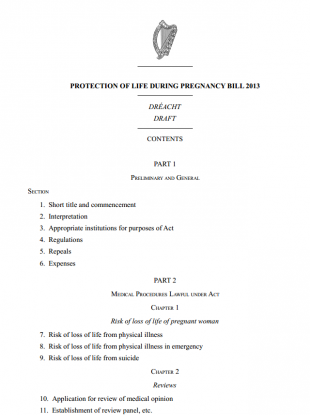 We bring you through the main changes to the Protection of Life during Pregnancy Bill, published early this morning. THE PUBLICATION OF the Protection of Life during Pregnancy Bill in the early hours of this morning has seen a number of changes to the text from the Heads of Bill published earlier this year. Following three days of hearings at the Oireachtas Health Committee in May, the government has published what it is terming ‘refinements’ to the legislation which will now go before the Dáil next Thursday. The legislation provides for abortion in circumstances where there is a real and substantial risk to the life – as distinct from the health – of a woman including the risk of suicide. As we know from the Heads of Bill, the legislation states that one doctor is required to certify a termination in the case of medical emergencies, two doctors will be required to sign-off on a termination in cases where there is a physical threat to life. And on the contentious suicide issue, where there is a risk to life as a result of the risk of self-destruction, then three doctors, including the woman’s obstetrician and two psychiatrists will be required to assess that risk. A provision for the publication of an annual report – to be published no later than 30 June – which will set out how many terminations have been carried out in the previous year based on notifications of dates and locations of these terminations to his department. The bill appears to broaden the category of psychiatrist who will be allowed to determine whether a pregnant woman’s life is at risk from suicide. The Bill states at least one – but not two – of the psychiatrists shall be one “who provides, or who has provided, mental health services to women in respect of pregnancy, childbirth or post-partum care”. The Bill states that it will be an offence to “intentionally destroy unborn human life” as distinct from the Heads of Bill which stated that “it shall be an offence for a person to do any act with the intent to destroy unborn human life”. Effectively, this means that intent to carry out an illegal termination that does not proceed does not make one guilty. This is perceived as a tighter definition. On conscientious objection, a provision in the heads that “no institution, organisation or third party shall refuse to provide a lawful termination of pregnancy to a woman on grounds of conscientious objection” has been removed. A medical practitioner who objects must organise for the transfer of care to another institution. The bill does not include a previously proposed ‘sunset clause’ under which the legislation would lapse by a certain date unless renewed. This has had been proposed by a number of Fine Gael TDs but the idea has been rejected in the final draft. Email “These are the main changes to the abortion legislation ”. Feedback on “These are the main changes to the abortion legislation ”.